My first book, This Tree Grows Out of Hell, was published in 1990 by HarperSanFrancisco, and was the result of a set of highly – perhaps even bizarrely — fortuitous coincidences. In the early winter of 1987 (about a year after my debut in Penthouse), I returned to my parents’ Northern Virginia house (a cow barn actually, that my father had turned into a living space for humans in the early sixties) to recoup after a couple of months working on a research vessel run by an old friend of my father’s. The expedition had been mounted to discover whether it was possible to use psychics to locate wrecks on the floor of the ocean in the Bahamas, and had been moderately successful, producing — after many months, much searching, and numerous visits to the boat from various high-profile psychics – a genuine shipwreck of some antiquity. As all had hoped, the ship had been loaded with valuable cargo when it went down – in the form of a special kind of wood from South America that was essential for the production of certain clothing dyes popular in Europe at the time. But several hundred years underwater had reduced the wood to dust, and a number of people left the expedition disappointed that something more valuable – gold, for example – had not been discovered by the psychics instead. Gold or no gold, however, the expedition was not a disappointment for me, for over the course of it, I’d become determined to stop thinking about becoming a writer and to actually try to produce something that would qualify as such — perhaps even by my fussy Sarah Lawrence friends’ standards. But what would this piece of writing be? That’s where the expedition had proved crucial. Most of it had unfolded in the shallow Caribbean waters just south of the twin islands of North and South Bimini in the Bahamas, where a little over a decade beforehand my father had launched a search to uncover the remains of the lost continent of Atlantis. I’d spent many of my off hours on the expedition reading Creative Mythology, the massive final volume of Joseph Campbell’s epic story of world mythology, The Masks of God. In the book, Campbell had a lot to say about the quest myth, arguing that it was perhaps the defining myth of Western culture. Reading the book, it occurred to me that I had been strangely fortunate to have been allowed to participate, first as a teenager and now as a twenty-something, in this double set of (to the average person at least) completely crazy Caribbean quest adventures. Campbell (following Mircea Eliade, another writer I was reading a great deal of in those years) suggested that all of human life and human culture could be seen as a quest to recover a lost but dimly remembered treasure: a treasure that people tend to see in concrete and worldly terms, but whose real nature is spiritual. Whether they were legitimate exercises in exploration or completely mad goose chases, both my father’s Atlantean quest, and his friend’s (in many ways more reasonable but still rather outlandish) quest for psychically located ship wreckage, were, to my mind, models of something: a larger search, for a larger, and much more important, if less definable, treasure. Back at the Barn, I was up in the attic looking through some of my father’s books one afternoon when the phone rang. On the other end of the line was a woman named Cynthia McAdams, a photographer who had taken a collection of photographs of Mayan ruins and who – the Harmonic Convergence of the summer just past still being in everyone’s heads – wanted to create a kind of new age coffee table book that would celebrate the mystical side of Mayan architecture. My father’s 1978 book Mysteries of the Mexican Pyramids had made him popular among people who held to the view, championed today by people like Daniel Pinchbeck and Graham Hancock, that the Mexican pyramids were the crumbling leftovers of a once planetary super-culture: the kind that people often associate with legends of Atlantis. Ms. McAdams told me she was thinking my father might be just the man to write a text to accompany her photos. When my father got home, I told him about the call and suggested that I might be of assistance with him on the book. After all, he’d been out of the loop regarding things Mayan for a while, and I could help him catch up on his research. “That sounds like a great idea,” he said, and to get me started on my research, handed me a book by Jose Arguelles called The Mayan Factor: Path Beyond Technology. 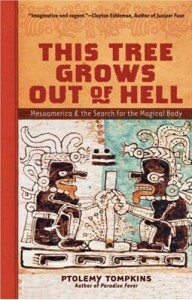 I tell all this in greater detail in the introduction to the revised edition of This Tree Grows Out of Hell, but the bottom line is that Arguelles’ book only reinforced for me the idea that new age people of all stripes were enacting the same basic story – or, more correctly, myth: the myth of the loss, and recovery, of paradise. Arguelles, with all his quasi-mystical stuff about the Maya’s telepathic connections with super-celestial consciousness grids, and so forth, was really just projecting, upon a safely vanished ancient people, a timeless mythological impulse: the desire to recover a currently lost, but desperately longed-for, state of innocence and grace that had once been, and might one day again be, the birthright of all humanity. But though the psychological motivations of Arguelles and his Harmonic Convergence associates seemed pretty clear, that didn’t mean there wasn’t some real power at work in his vision of things. Arguelles might not have been entirely right about the Maya, or much else for that matter, but to me that didn’t mean that his ideas were a simple fantasy, end of story. It was more complicated than that. Silly and irresponsible as the new age view of things could be a lot of the time, there was something about it that I couldn’t help feel was right, and vital, and genuinely on the mark for the time we lived in. In fact, in a weird but inescapable way, I realized that I was sort of a new ager myself. That was why, though I often got irritated with the fine points of all the new age junk I’d seen going on around me all my life, that stuff also fed my imagination, and my sense of who or what I wanted to become, in a significant way. I decided that if I was going to write about the ancient Maya, I wanted to write about them in the context of that same ancient longing for paradise that I saw disguised in so much of the preoccupations of the new age people and writers I’d spent so much of my life around. For the ancient Maya, though most likely a very different people than Arguelles and his associates thought they were, did share one very important thing in common with them, and that was the belief that the world had, at one time, been an altogether different, and better, kind of place than it was now. The Maya may not have been the benign spiritual culture that Arguelles thought they were, but nonetheless, they too both remembered, and longed to recover, the more-than-simply-human condition of paradise. So, using the same nepotistic skills that my father had employed some decades before for securing his own first book (a collection of letters between his grandmother and George Bernard Shaw), I gradually horned my way into Ms. McAdams’ Mayan project to the point where my father was no longer involved in it at all, and I was to write the main text all by myself. Before too long, Ms. McAdams (rather understandably) retreated from the project altogether, securing a contemporary Mayan shaman to write the text she was looking for, and I was left to pursue my thoughts on the ancient Maya and what they’d thought about the world entirely on my own. With a stack of books and the big beige IBM computer that my sister and brother in law had given me for Christmas the year before, I drove back up to Massachusetts, moved into a house with some of my friends there, and set to researching in earnest. Without Ms. McAdams’ feelings on the matter to worry about, I soon found myself focusing not just on the Maya but the Aztecs, the last of the major Mesoamerican civilizations and – according to popular opinion at least – the most violent and bloodthirsty. The way most of the popular books had it, the Aztecs were really nothing but late-in-the-game imitators of the far more brilliant and sophisticated Mesoamerican civilizations who had preceded them: ugly minded vulgarians more interested in power and conquest than on discovering the secret harmonies that underlay the universe. But this reading of the Aztecs, extremely common in the more popular writings on Mesoamerica though it was, wasn’t really correct. With their fixation on ritualized violence, their combination of deep reverence and profound suspicion of the universe and its workings, the Aztecs struck me as a curiously modern and, in a weird way, curiously understandable ancient people. I used the recent work of Linda Schele and Mary Ellen Miller to show how the Maya were really not the benign mystical stargazers their new age admirers thought they were, but a power-and-politics civilization every bit as devoted to violence as the Aztecs had been, if not more so. Mesoamerica’s whole millennia-long tradition of ritualized violence had, I decided, important things to tell us about our own preoccupation with the dark, horrific, and uncanny side of the world. The Aztecs, unlike us, entertained no real doubts that the spiritual world existed: but they were unsure in the extreme about what the intentions of that world were toward them – and that was where the real parallels with us arose. It seemed to me that the Aztecs — marooned as they were in what they saw as an extremely hostile universe where the gods needed human beings for sacrificial food but for little else — were, in a strange way, very similar to us modern materialistic humans, stuck as we are in a cold and essentially carnivorous universe about whose ultimate intentions we were just as suspicious and unsure of. The “magical body” that I claimed the Aztecs were secretly in search of wasn’t really something I’d read about in any actual book on the Aztecs. The fact is, I just kind of felt they must have been looking for such a thing. The whole idea of a quest for some kind of lost spiritual body somehow just appealed to me, and had done so ever since a few years beforehand, when I’d read the final pages of Norman O. Brown’s Life Against Death. Referencing the literary critic Geoffrey Hartman, Brown suggested that life itself might be, at bottom, a kind of journey on the part of consciousness itself, in search of a “body” that was truly appropriate to it. A body that, as paradise myths from cultures the world over suggested, it might have lost at some distant point in the past, and which – as new age thinkers correctly intuited – it was destined to someday recover, in a new and higher form. In the summer of 1986, while working at Endicott Booksellers in New York, I’d come across Aime Cesaire’s poetry collection Lost Body (translated by Clayton Eshleman), and the book’s title had resonated with me in a way I couldn’t quite explain but couldn’t quite forget. In This Tree Grows Out of Hell, I took my first stab at figuring out why it had, by suggesting that there was once another kind of world, which we inhabited in another kind of body: a paradisal body that we had lost, and that our current body is but a sad shadow of. This is a completely mythological idea, and if one talks about it that way and leaves it at that, no one lifts any eyebrows. But it seemed to me that just seeing this idea as some appealing psychological archetype that explained certain universal human intuitions but wasn’t really based in reality, didn’t really get one anywhere. What if this lost body, and the lost and one day perhaps recoverable paradisal world it inhabited, was more than just some insubstantial psychological complex? What if, in short, it represented something real? As much as anything else, This Tree Grows Out of Hell was an experiment in talking about such matters as if they might really and truly be realities. The book came out in 1990, and – as far as I can tell – was read by very few Mesoamericanists, and served only to irritate those who did read it. This is pretty understandable. After all, I didn’t know a thing about Mesoamerican civilization before I put the book together, and the book is in many ways as much about what it felt like to be a twenty-something-year-old in the America of the 1980s as it was about the ancient Aztecs. The book is strewn with references to modern literature and pop culture, and its centerpiece is a poem called “The Half-Finished Heaven,” by the contemporary Swedish poet Tomas Transtromer, which I’d first come upon in Robert Bly’s anthology Friends You Drank Some Darkness. Bly’s work had led me to James Hillman (many of whose ideas were another influence for This Tree), and Hillman in turn led me – via his Eranos monograph “The Thought of the Heart” – to Henry Corbin, the French Islamicist who turns up in one place or another in almost all my books. Bly also led me, via an early issue of the magazine Poetry East, to the work of Louis Jenkins, whose work, especially his poem “Violence on Television,” has quietly influenced just about everything I’ve written. Oddly enough, I don’t think I ever could have written This Tree Grows Out of Hell if I hadn’t come across it.